Print All Over Me is another print on demand company that I like to use. Unlike Zazzle or Cafepress where designs can be added to greeting cards, paper plates or wrapping paper, for example, Print All Over Me is mainly for designing clothing items. They print the design to fabric and then custom make each item as ordered with a 2-4 week delivery time. It is fun seeing my designs and vintage photos come to life on a garment. There is a large selection of pieces to choose from such as dresses, shirts, pants and even rain coats. The tricky part is getting the image I upload to fall where I want it on the piece. This is an old picture of my mother when she was a little girl all dressed up western to have her picture made on a pony. 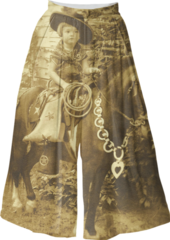 I was able to get the picture arranged just right to come up with a cool looking western skirt/pant. If you want to make a custom clothing item for yourself, you can. You can also leave it in their marketplace for sale. So if you ever had dreams of being a fashion designer of some sort, this could be a start. You can see my collections here to get a better idea and go to the home page for Print All Over Me and read more about them.